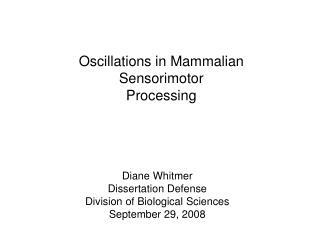 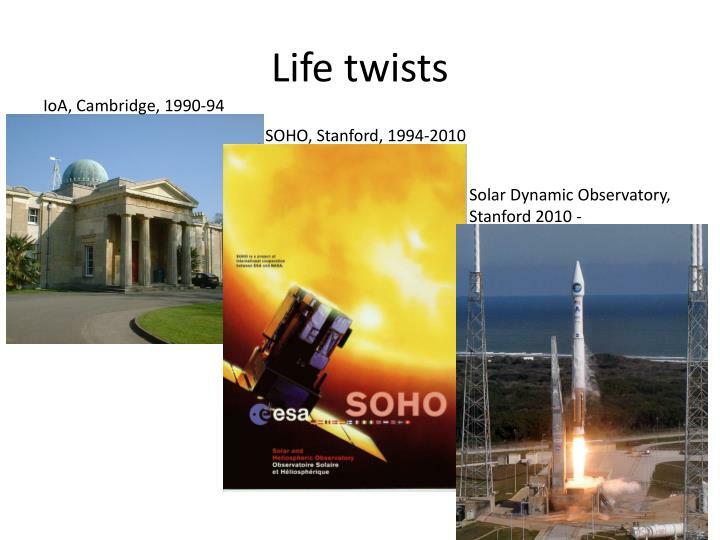 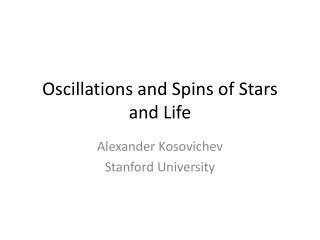 Oscillations and Spins of Stars and Life. 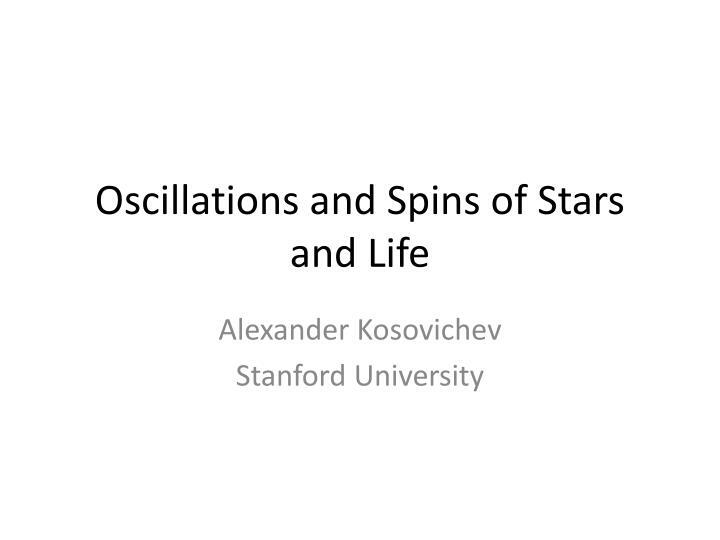 Alexander Kosovichev Stanford University. 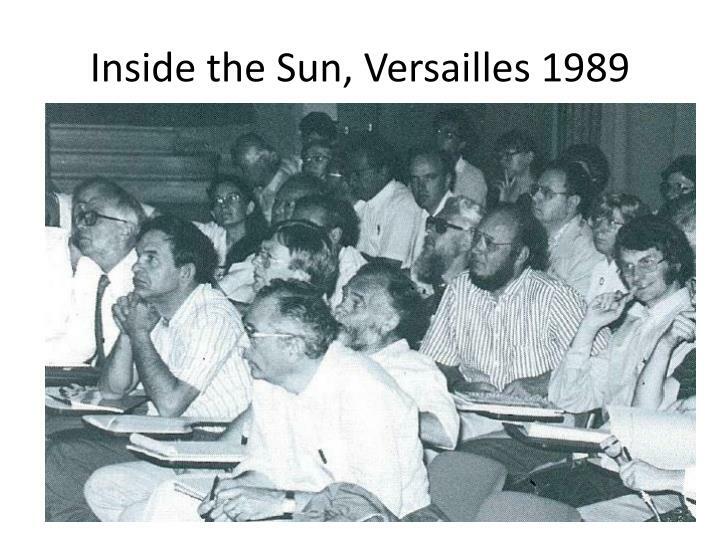 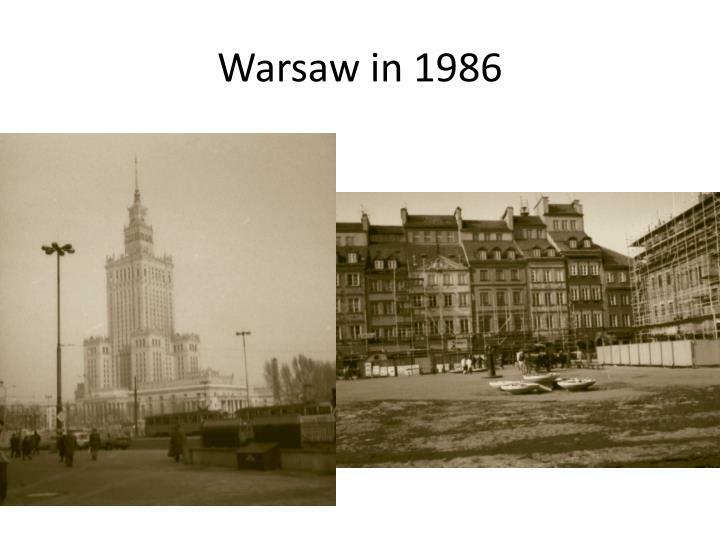 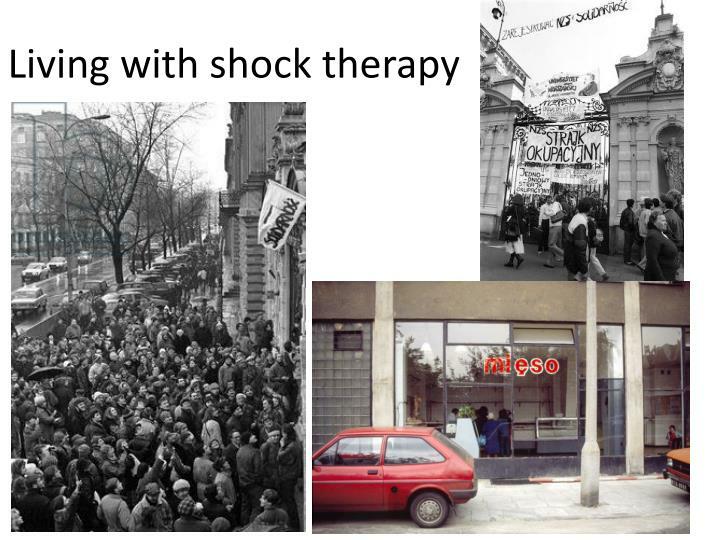 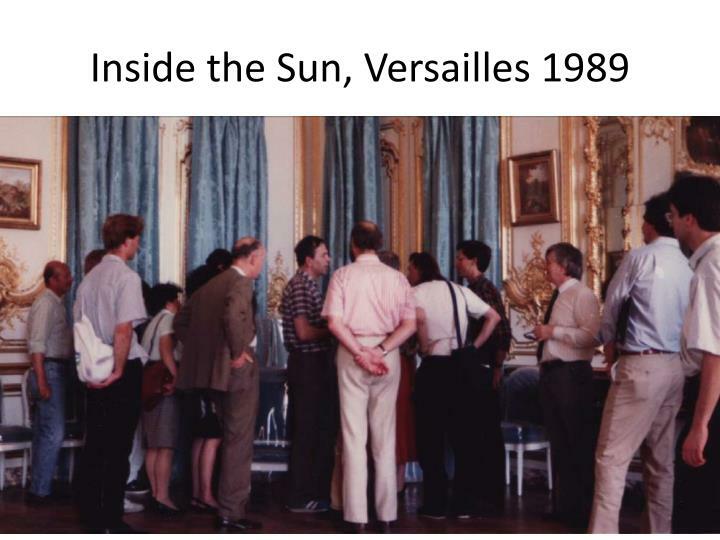 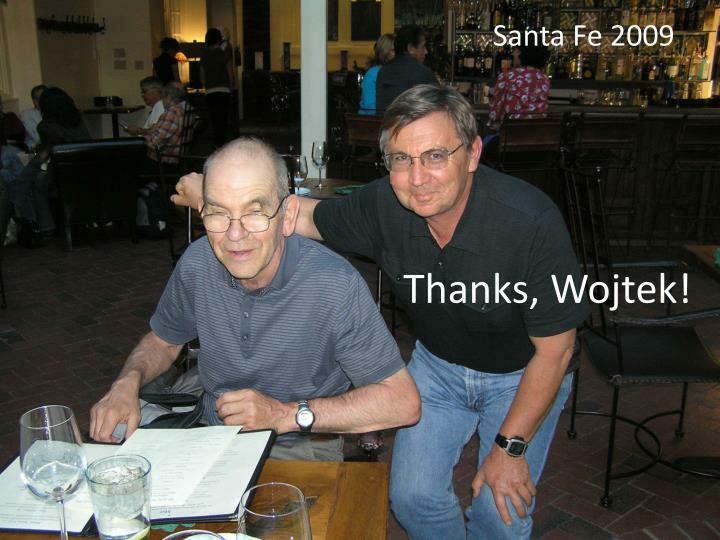 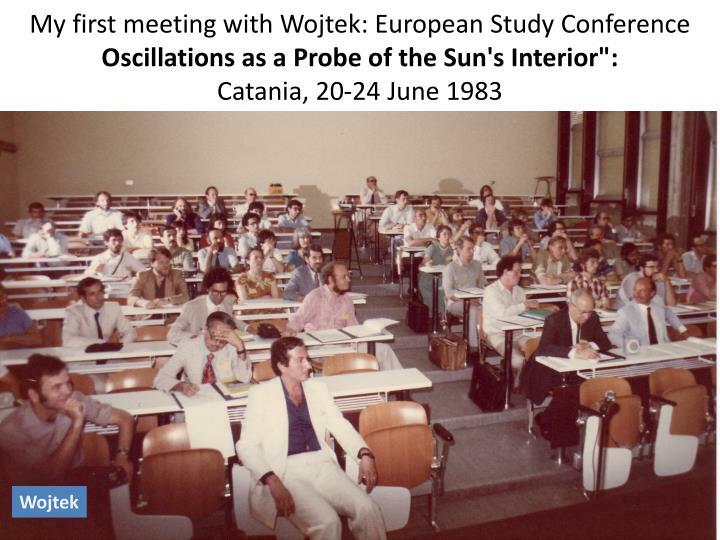 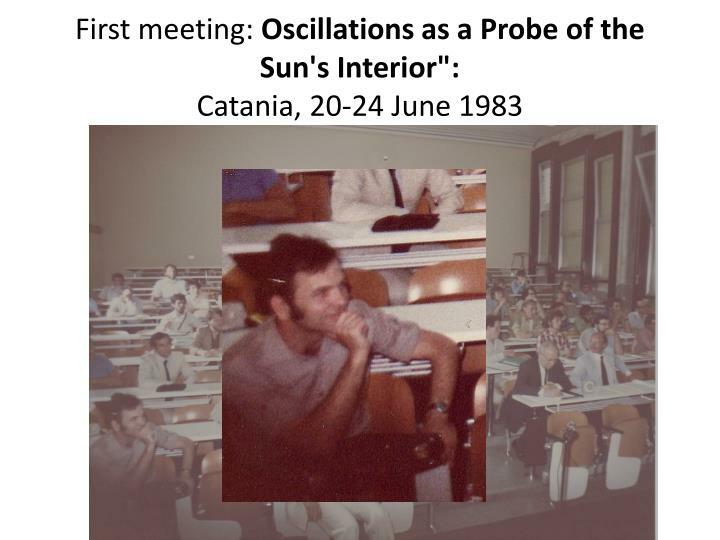 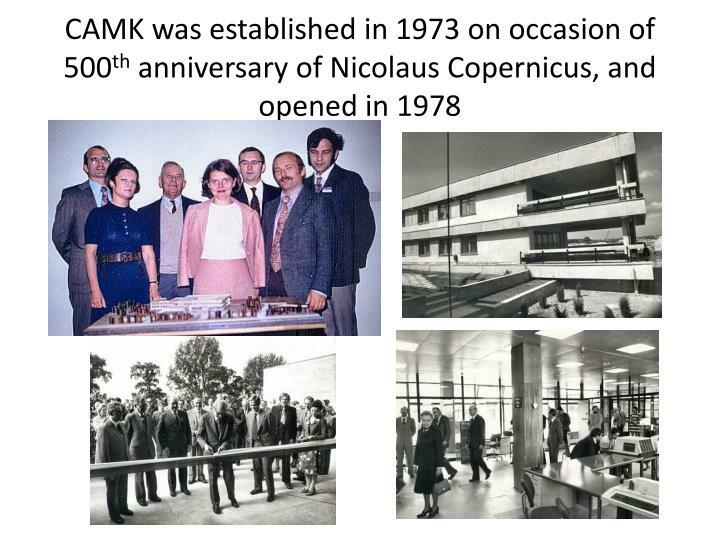 My first meeting with Wojtek : European Study Conference Oscillations as a Probe of the Sun's Interior": Catania, 20-24 June 1983. 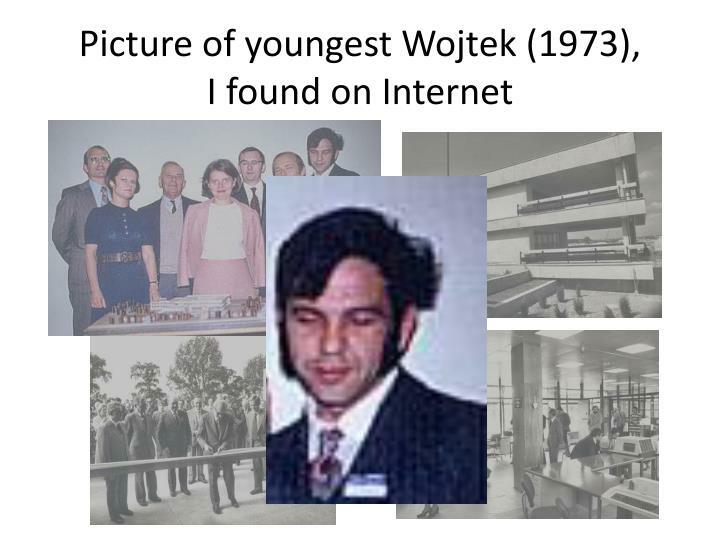 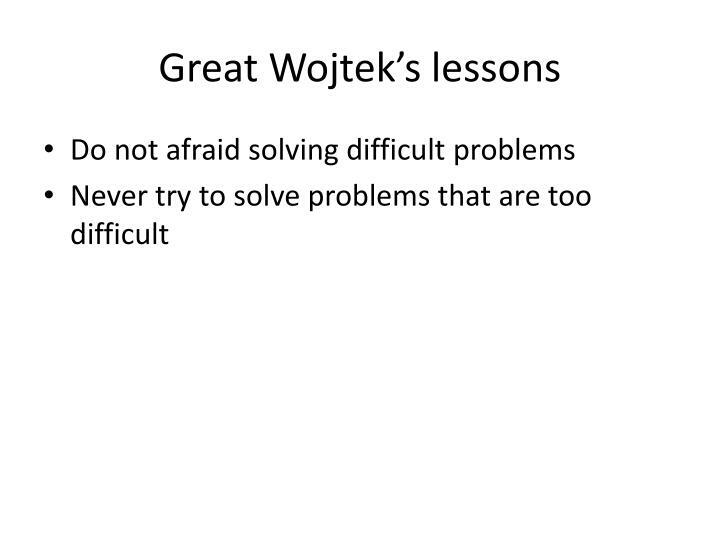 Wojtek. 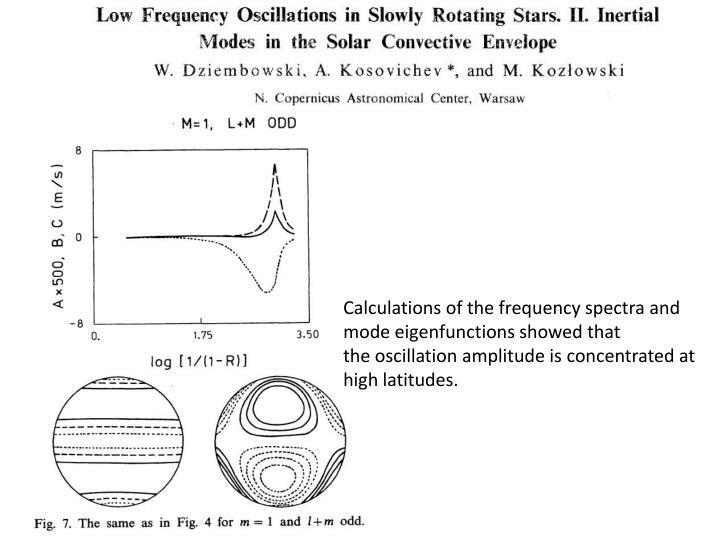 Dziembowski, W. and A. Kosovichev (1987). 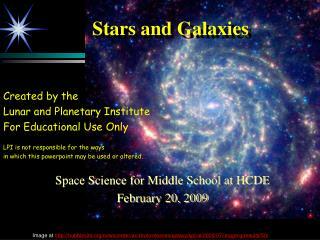 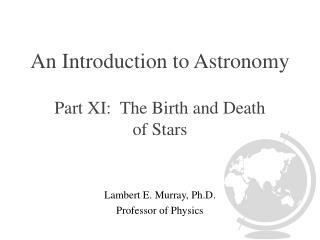 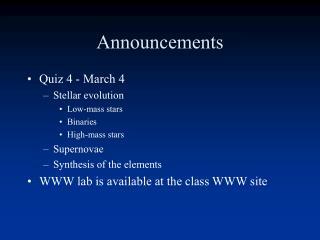 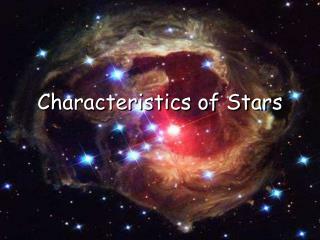 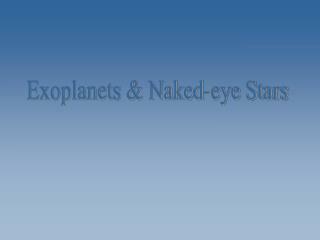 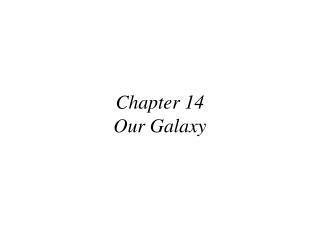 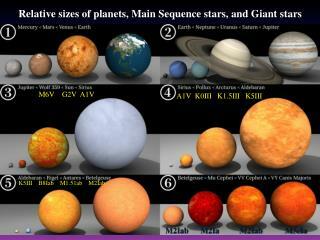 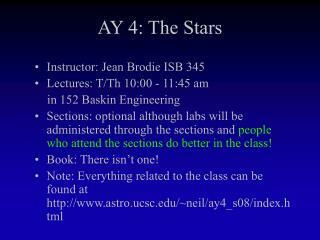 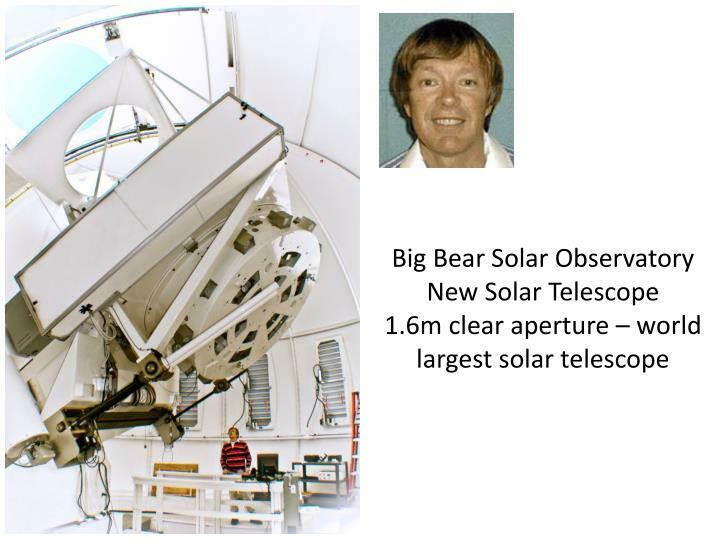 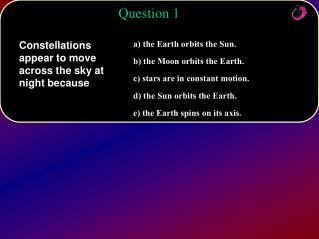 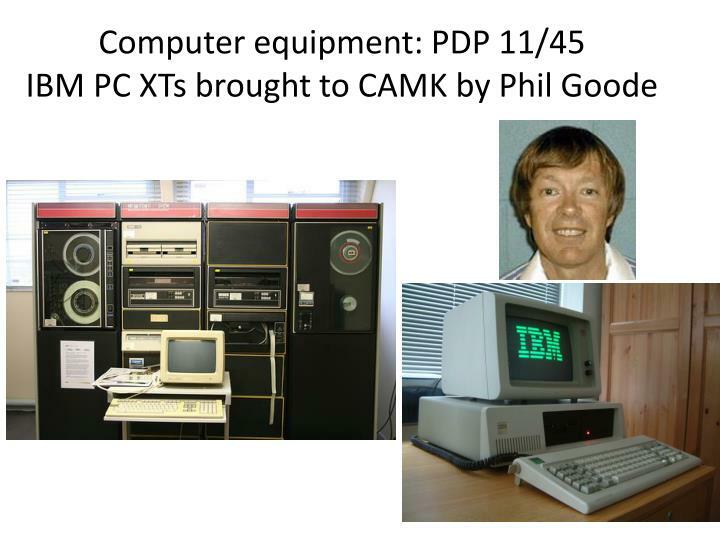 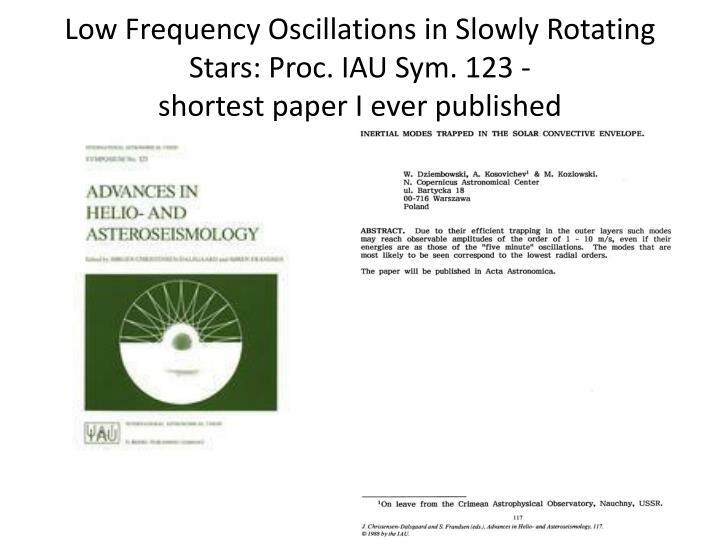 "Low Frequency Oscillations in Slowly Rotating Stars - Part One - General Properties." 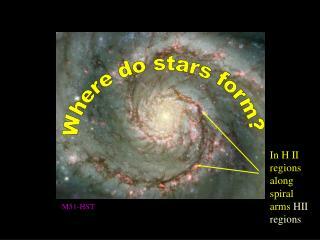 ActaAstronomica37: 313. 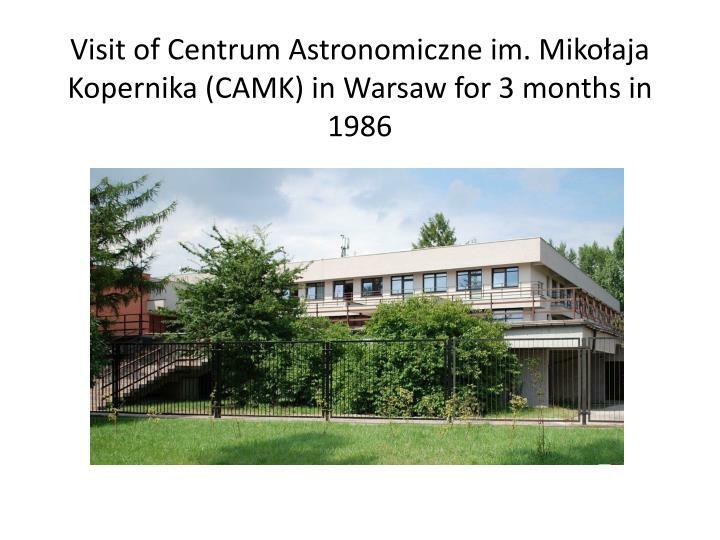 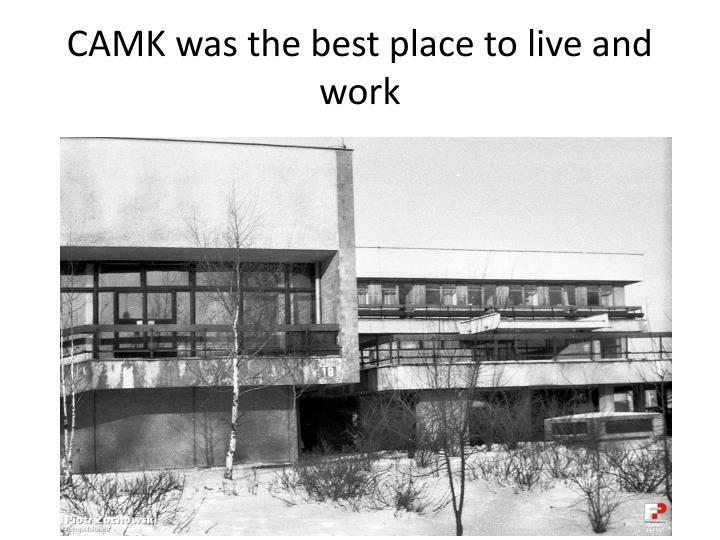 Dziembowski, W., A. Kosovichev, and M. Kozlowski (1987). 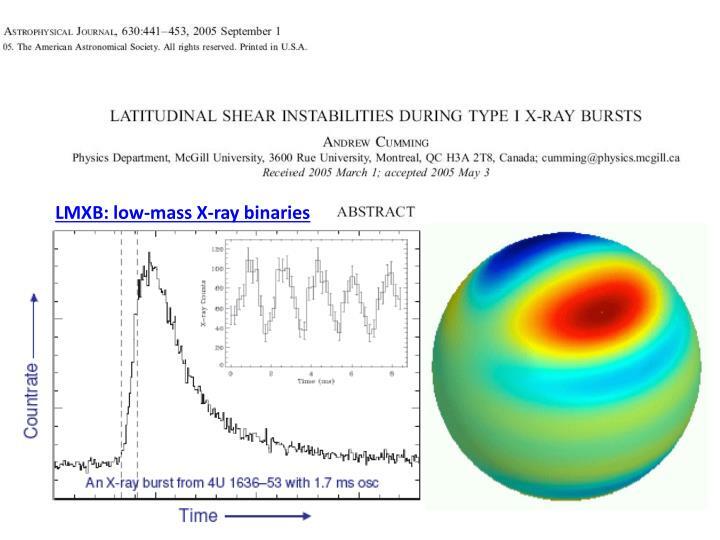 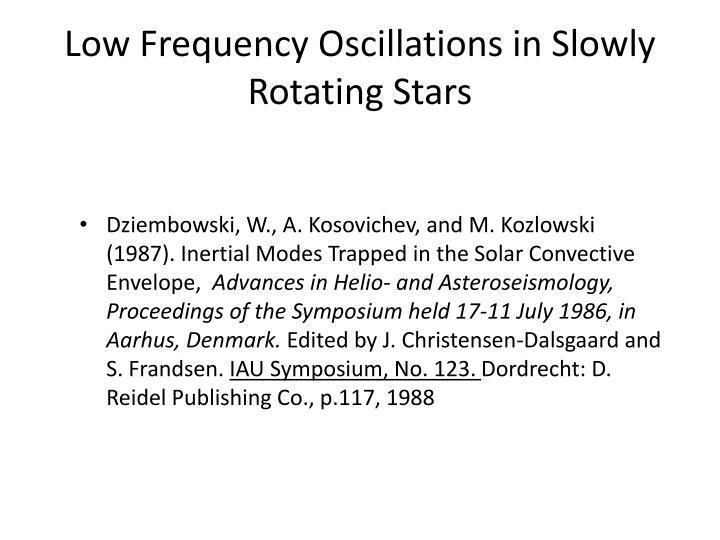 "Low Frequency Oscillations in Slowly Rotating Stars - Part Two - Inertial Modes in the Solar Convective Envelope." 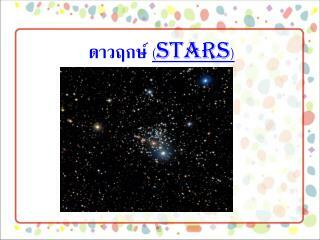 ActaAstronomica37: 331. 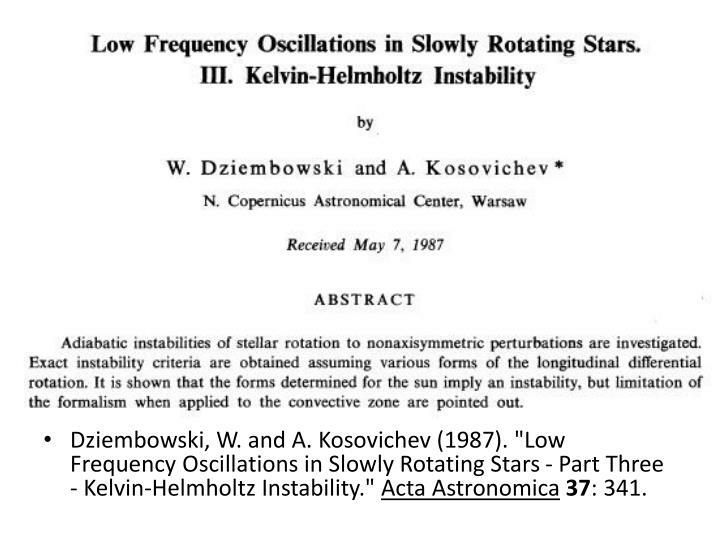 Dziembowski, W. and A. Kosovichev (1987). 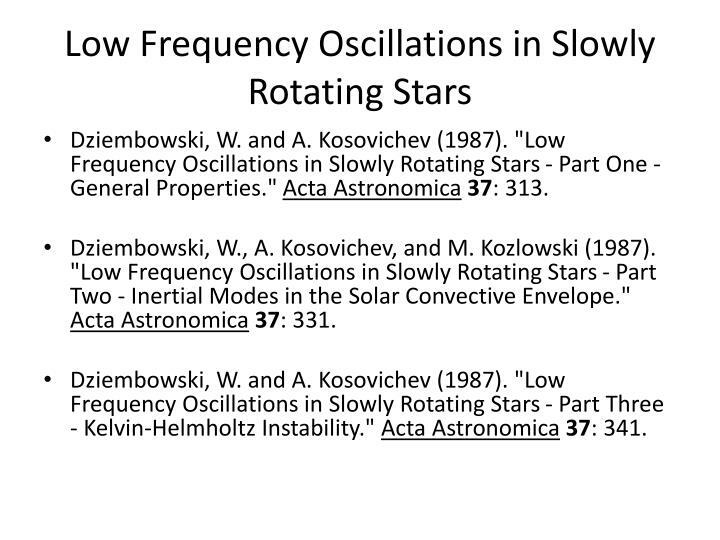 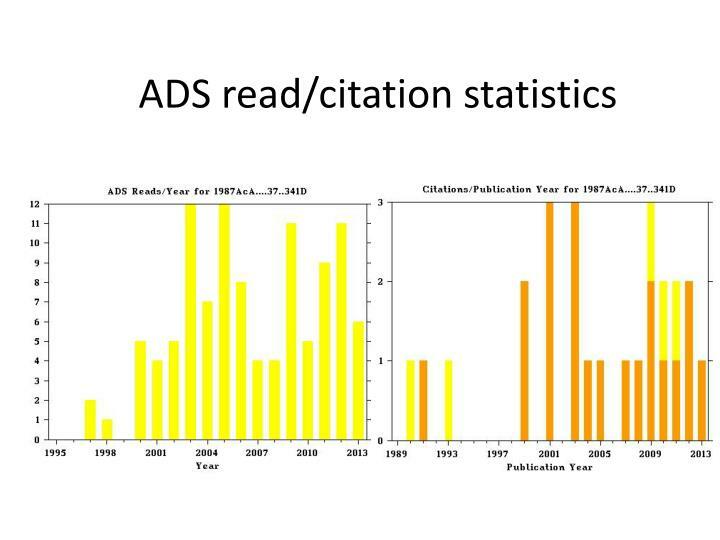 "Low Frequency Oscillations in Slowly Rotating Stars - Part Three - Kelvin-Helmholtz Instability." 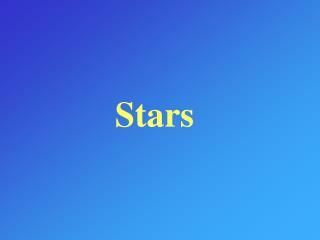 ActaAstronomica37: 341. 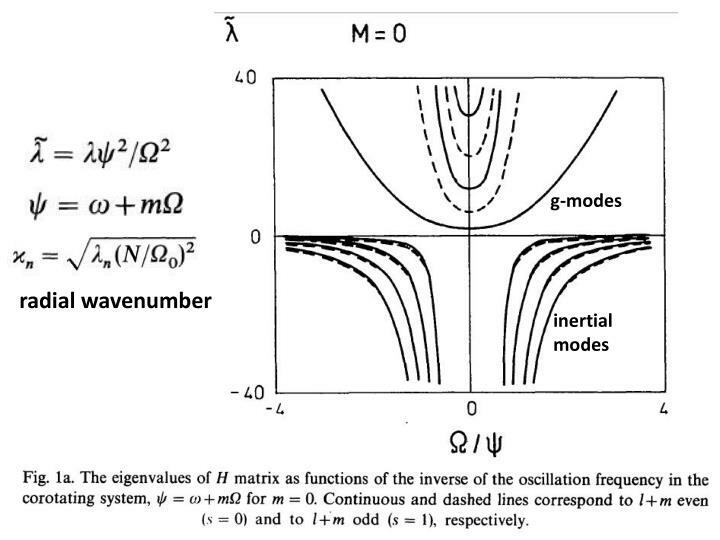 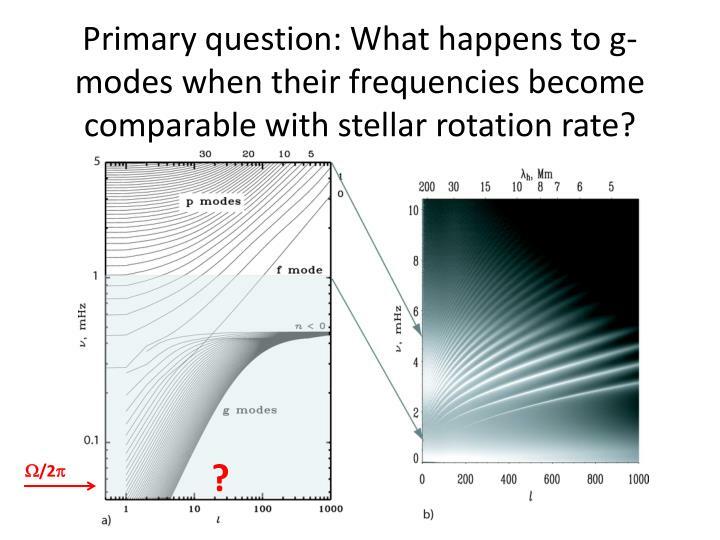 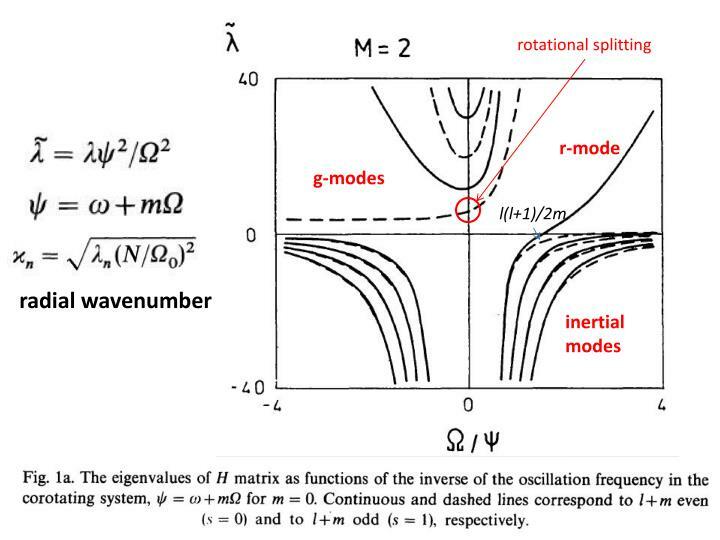 Primary question: What happens to g-modes when their frequencies become comparable with stellar rotation rate? 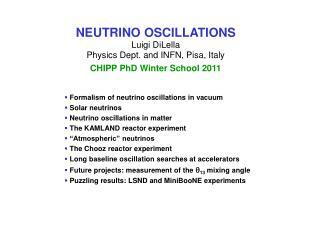 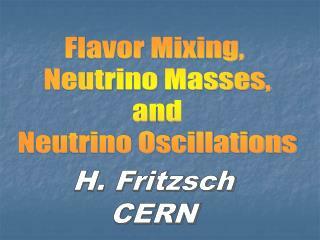 Flavor Mixing, Neutrino Masses, and Neutrino Oscillations -Flavor mixing, neutrino masses, and neutrino oscillations. 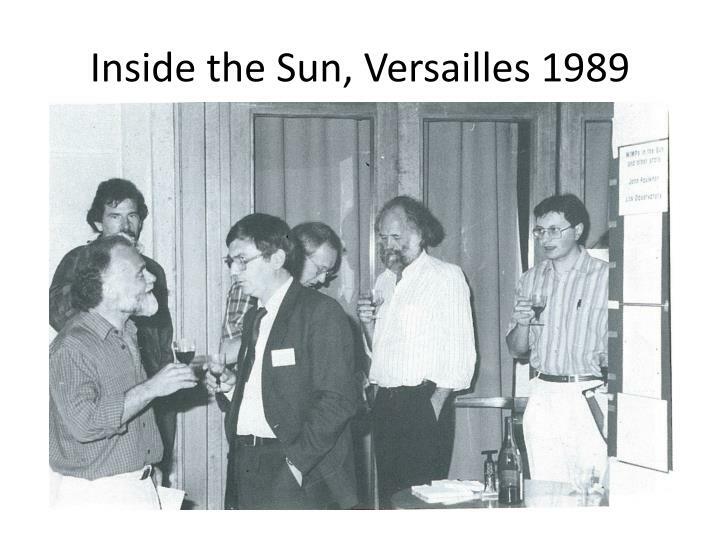 h. fritzsch cern. 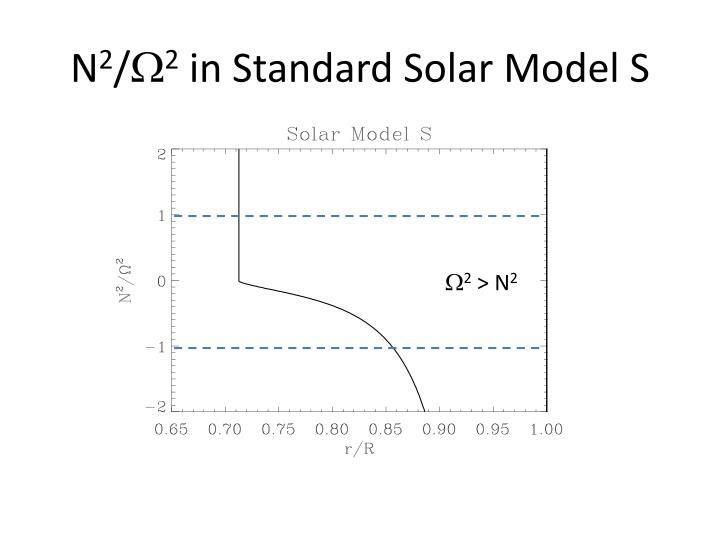 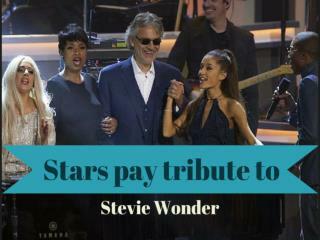 standard model. 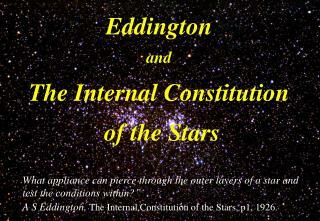 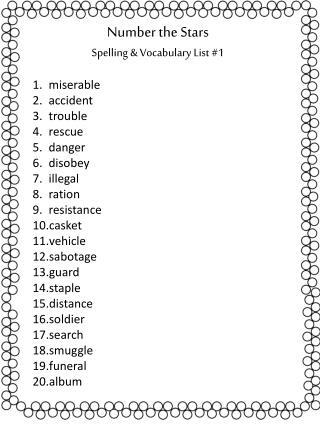 28 fundamental constants. 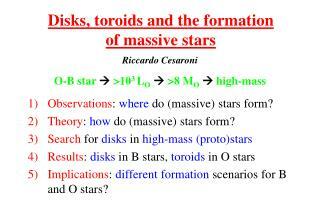 4. g. 14. g. 28. g. (22 related to fermion masses).